And I’m sure you’ve witnessed the drama… the thinly veiled bashing of other people, whether or not actual names are used. The posts that purposely stir people up. The click-bait headlines. Closed-minded arguments, sweeping generalizations, broad stereotyping. The petty and just downright mean things people say online. And during this election cycle… well, things have gotten ugly. I feel strongly, too, and I want people to see what I see, to know the “truth” as I believe it to be. I feel a very strong a sense of danger and foreboding, and I want to make sure people understand what is at stake. At the same time, I love to have open dialogue, to learn what makes you believe the way you do and to hear what’s behind my beliefs, too. But that rarely seems to happen. It might start out okay, but then it rapidly disintegrates. No, I’m not calling people pigs. (Although sometimes that might be true.) The way I interpret this verse is this: Use wisdom. Think before you share something because this might not be the right time or the right place for this. Don’t waste your good words on someone who will trample them. Before you throw them out there, evaluate the environment. Like many of you, I want to share things with people. I get it. I really do. Which is why being on Facebook the past few weeks has been hard on me emotionally. My spirit grieves. I mourn the ugliness and hatred. I have trouble picking myself up when these things pull me down. When I say these things, I’m not pointing my finger at anyone. I’m as guilty as anyone else of giving in and telling about my crappy day, or complaining about poor service, or of getting snippy with someone who is perpetuating information without first fact-checking or seeing if there is even a vein of truth to it. I want to correct people’s perceptions, and sometimes even when people are accurate in their understanding, I just plain disagree and want to change their minds. But there’s a time and a place for that. And based on what I’ve seen over the past years, but especially these past few months, I don’t believe Facebook is the place for it. Because it’s not well-received. We sit behind our keyboards and screens and type things we would never speak face-to-face. We can have good, helpful, respectful conversations. It really is possible. But in my experience, those work best when we’re sitting at a table with cups of coffee in front of us, when we can see the expressions of our companion, when we can ask questions with nuances unavailable through emojis. What grieves me the most is when I see a distinct lack of love and compassion from people who call themselves Christians. Each person’s faith, or lack thereof, is their own. I can’t judge it, and I try really hard not to. We each have to come to terms with the God we believe in. I’m proud to be a follower of Jesus. But I’m not proud that so many non-Christians look at the things being said and done in the name of Jesus, and they wonder what kind of God we have. They can’t accept someone who exhibits certain behaviors, and they see no appeal whatsoever to a life of following a God who supports this. But one thing I know is that much of what I see doesn’t look or sound anything like the God I adore. 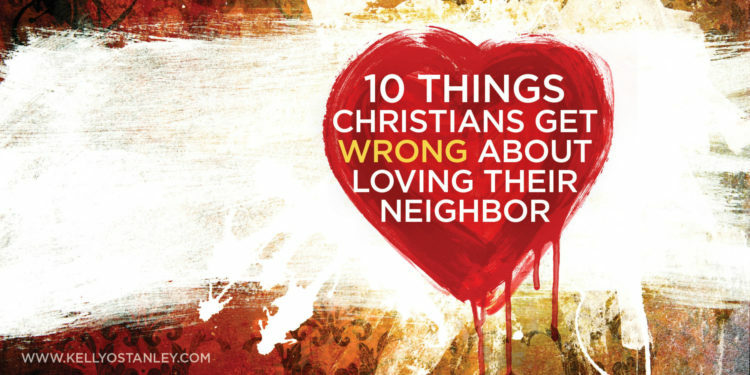 I don’t know if I can say this without sounding like I’m judging and criticizing—but I’m truly heartbroken by what some of these behaviors tell the world about my God. Because the God I worship is one who loves. He always loves. Love comes first, before any change of heart, before any depths of understanding are reached. When people see love, they’re supposed to understand that we belong to God. This, however, doesn’t seem to be the case as often as I’d like. So I’ve struggled. Do I need to leave Facebook for a while, too? And then I decided NO. I will not leave. I don’t believe in running away when I don’t like something. I am a fixer. I want to try something new. I want to find creative solutions. I yearn to be the catalyst for a good kind of change. The truth is, I have very little influence in this media-saturated culture—I have more Facebook friends than some, and a fraction of what others have—certainly not enough to pull this off on my own. And I really, really want to do something. Maybe I’m weird, but I happen to like Facebook. I enjoy reconnecting with people. I like feeling as though I have some general idea of what people are experiencing on a daily basis. I have found great encouragement from people who send the perfect message at just the right time. I have been lifted up by other people’s stories of God coming through, of those who witnessed the kindness of strangers, who were able to use this as a way to build people up, not tear them down. So I decided to do something. Maybe it won’t make a bit of difference. But maybe, just maybe, it will. If you will help me. 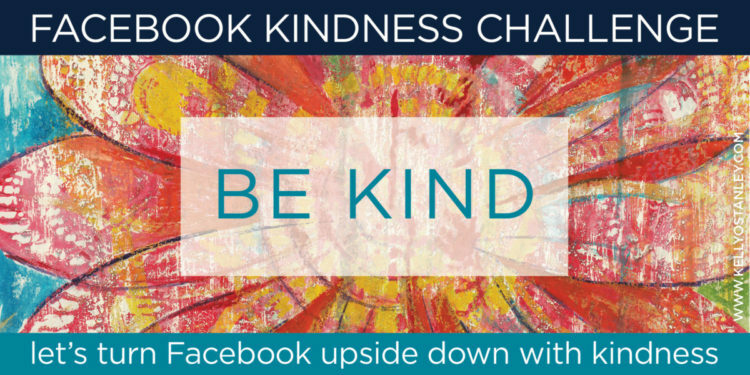 Starting June 1, I am going to be posting kindness challenges for the next 21 days. They’re simple things—some focused on ourselves, some on others. A few are supported by Bible verses and prayer, and some are based on other quotes and ideas. This isn’t a spiritual campaign, necessarily—other than the fact that Jesus told us to do to others what we would have them do to us (Matthew 7:12, Luke 6:31). But you don’t have to be a Christian to believe in respect and kindness and understanding. And to recognize that having more of those things present would surely be a good thing. I’ll be asking people to do things like spread a little happiness, share what inspires you, and lift up someone besides yourself—nothing hard, but maybe not the things that come automatically in response to what we see. I’m not calling for hypocrisy. Don’t just put on a happy front and be bitter and resentful underneath—that won’t help a thing. But I’m asking you, and I’m asking God, to try to change our hearts. To open us up to others. To realize that we’re all connected in many ways. To discover that, yes, we have differences. But we also have a lot in common. And that before we can see anything good happen, before we can turn a toxic environment into a nurturing, encouraging place to thrive, we have to take some steps towards what we want. Each one of us. If you’re on Facebook, and if you, too, are unhappy with the atmosphere there, won’t you come along with me for this ride? I’m still naive and hopeful enough to think that we can make a difference. I know that 21 days is a short span of time. This is just the beginning. One step at a time… but if we take enough steps, pretty soon we’ll end up in a whole different place. And everyone knows a trip is a whole lot more fun when your friends come along for the ride. Poor me. All I’ve talked about for weeks is my elbow. I’ve spent the last week with my right arm immobilized in a brace. Most of the time has been spent half-snoozing, system full of pain-killers. Mindless Netflix episodes. A couple frivolous books. Trying not to criticize my husband for not doing all of my usual tasks exactly the way I would do them. Eating isn’t even much fun when it’s all about getting enough in your stomach to keep the meds from making you nauseous, and having someone else cut your food, and then shakily balancing food on an awkwardly grasped fork, hoping to end up with more in my mouth than tumbling down the front of my shirt. Several friends, upon hearing about my injury, asked if it’s my writing hand. Yes. But I spend so much time typing that I didn’t think it would bother me much in that respect. Oh, what we take for granted. Signing a check or charge slip. Jotting new activities and kids’ sports practices on the calendar. Writing quick reminders on post-it notes. Grocery lists. Addressing an envelope. Filling in the answers in my Bible study book. Scribbling insights in the margins of books I’m reading. I typically spend lots of time with a pen in hand. A Tul medium point blue gel pen, to be precise. I love filling pages of any kind with my handwriting, smooth and glob-free thanks to my trusty pens. But I jot things down because I can’t remember everything and there’s always so much to remember. Maybe I need to slow down and simply remember. Interestingly enough, I just now got an email notifying me that a blog post of mine just went live on Devotional Diva, a site I’m excited to be writing for. Prayer for the Overwhelmed. The words I wrote weeks ago minister to me now. Huh. Funny how that happens. I have no doubt that God is trying to teach me something. Slow me down and teach me to lean on Him in new ways. The first of these lessons I’ve already seen. Friends — people I think a lot of but don’t know well — have sent me cards. Actually stopped what they’re doing after seeing my posts on Facebook, and sent me cards. I’ve gotten texts and gifts and food. Apparently, there are still a lot of loving and thoughtful people in this world. People so much kinder than I am. But the most humbling moment came when my friend Sherry walked into church Sunday. She has several serious medical issues and recently fell, hard, further injuring her already painful, messed-up back. She came into church, leaning on a cane, grimacing from the effort. Yet she threw her arm around me, hugged me, and said she’s been praying for me and worrying about how I’m doing. She. Has been worried. About me. I think that when we’re hurting, when we are facing a big change (whether tragic or emotional or physical), our natural response is to close in. Our world gets smaller. The pain defines us and gives us blinders to everything else. 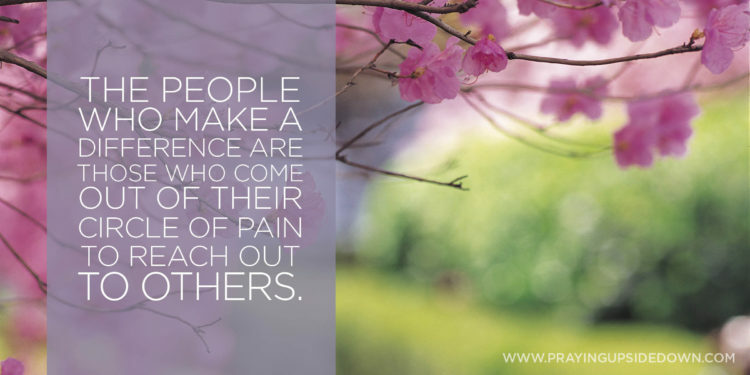 But the people who make a difference are those who uncurl themselves, who come out of their circle of pain to reach out to others. Those who are not defined by their circumstances. Those who use their experiences to embody their compassion for others. Those who understand that even in pain, even in sorrow and hardship, God reigns. He never leaves. He’s not angry and punishing them. He loves and soothes and comforts and forgives and teaches and reveals and enlightens. He reminds us that no matter how lonely we might feel, we are not alone. We are not forsaken. We should not despair. We should, quite simply, love. LORD, don’t let me waste this time. Don’t let me fill it with mindless noise and fail to hear Your voice. If I have to slow down, let this time have a new kind of value. Let my mind slow and my soul learn to wait. Remind me to listen. And teach me this kind of generosity of spirit. Help me love like You would. Amen. 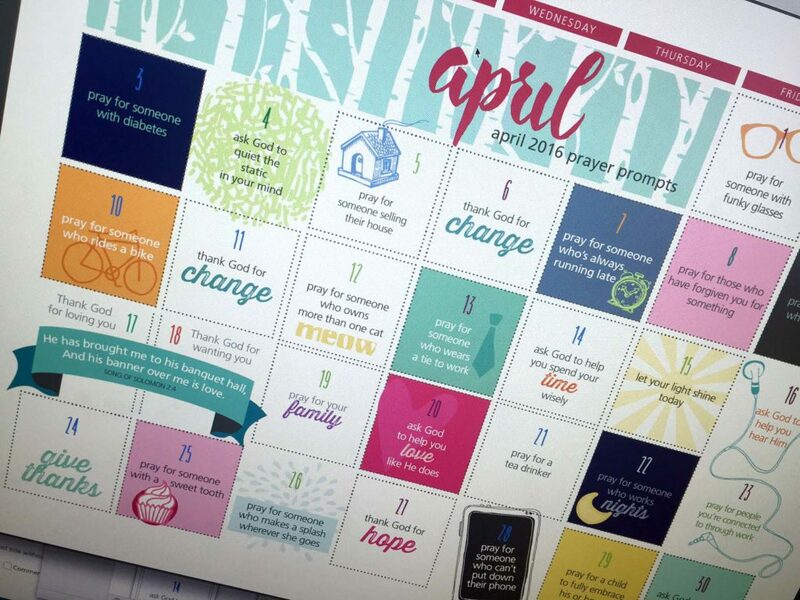 Luckily, I prepared the April prayer calendar before my surgery so it’s here and ready to go!